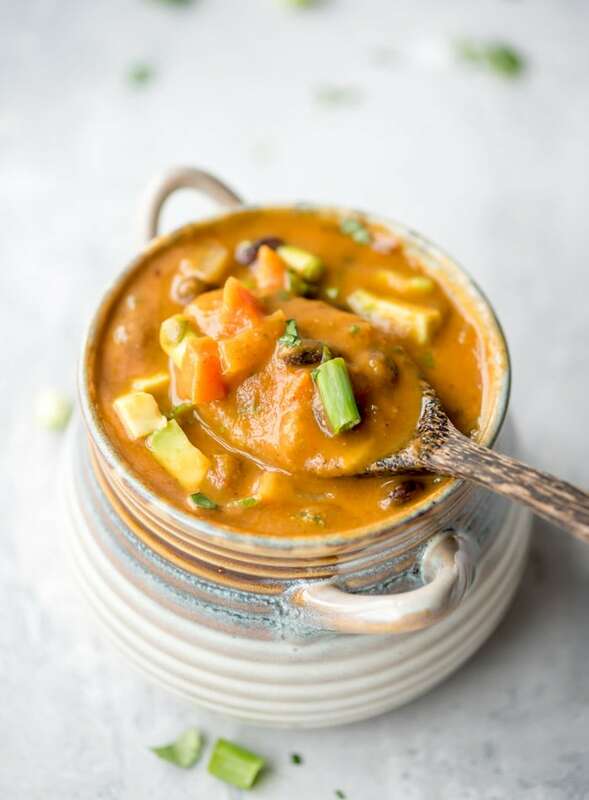 This spicy vegan black bean soup is easy to make, incredibly filling and satisfying and has just the right amount of spiciness. It’s made with simple ingredients like onion, garlic, carrot, tomato sauce and black beans but still full of flavour and nutrition. Add some avocado to that and you’ve got a perfect meal in a bowl. This recipe is high in protein, complex carbohydrates and very low in fat. I blended mine for a creamy black bean soup but you can also leave it unblended if you prefer a chunkier soup. Cancer-fighting thanks to their flavonoid content, in particular, free-radical fighting anthocyanins. Heart-protecting thanks to their high soluble fibre content. I was very scientific above, wasn’t I? But it is true, black beans have a lot going for them. Black beans aren’t usually considered a phytonutrient-rich food but much like brightly coloured veggies, that dark, black colour is where the good stuff is! I include black beans in my diet as often as I can, along with all other beans and legumes. They’re such a great source of fibre and plant-based protein and are so versatile and inexpensive. Why Make Black Bean Soup? Haha, I’m not very good at writing about food…for me, a good recipe is easy, quick, inexpensive and tastes good and this soup fits the bill. I hope you enjoy it. Oh, and if you don’t want a “spicy” black bean soup, just leave out the jalapeños. It’s delicious either way! OR, try it with chili peppers in adobo sauce for a chipotle-flavored black bean soup. 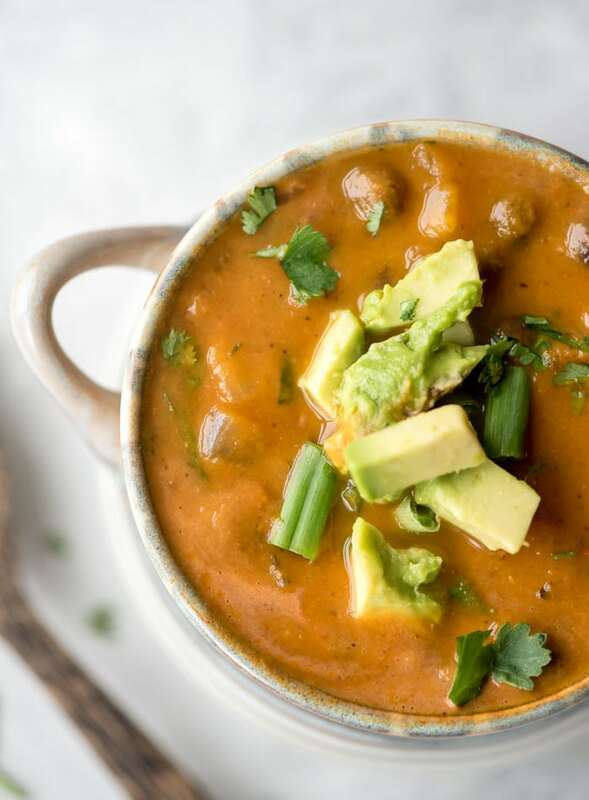 To take this soup to the next level, try topping it with diced avocado, crushed tortilla chips, vegan sour cream and salsa. I love making lots of soups in the colder months. I never get tired of them. They’re quick, easy, delicious, healthy, great for meal prep and there are endless creations just waiting to be made. 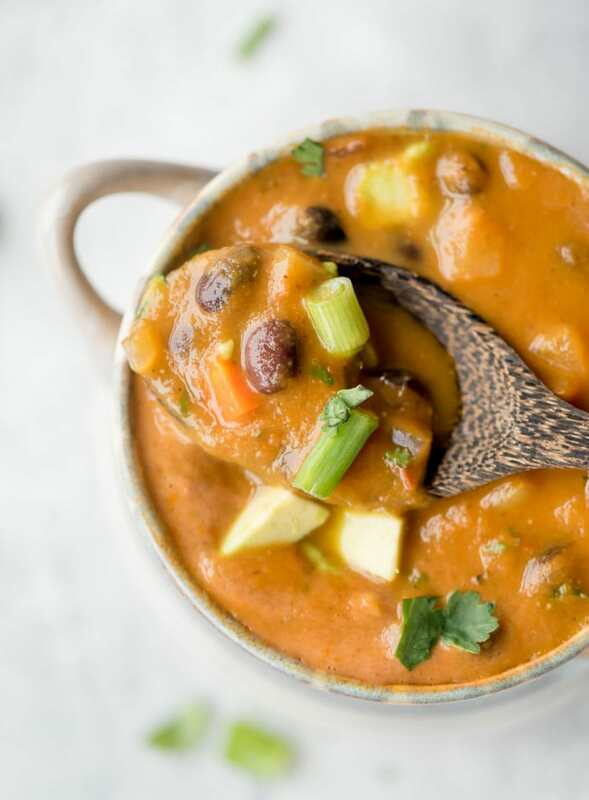 If you love this black bean soup, give these recipes a try, and if you’re looking for another bean soup recipe, don’t miss the chickpea chowder. It’s one of the most popular recipes on the blog. 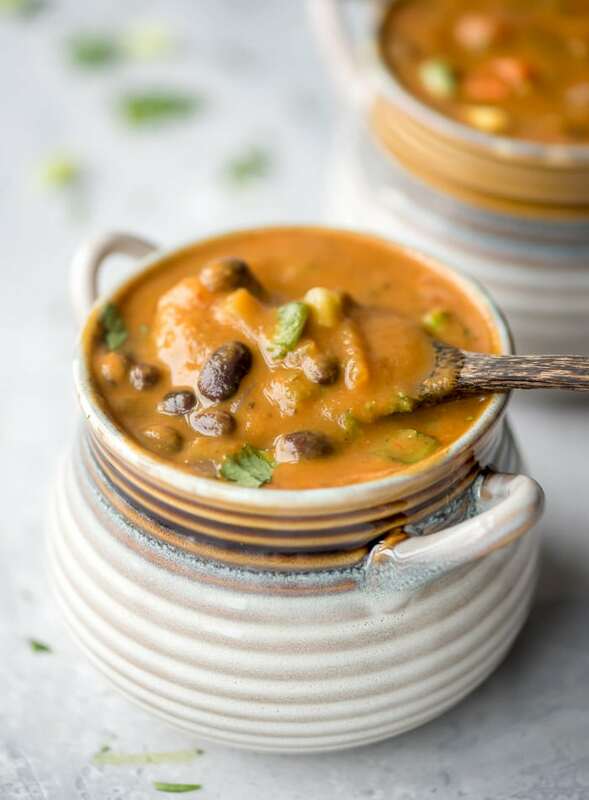 This hearty soup is easy to make and comes together in under 30 minutes making it a great recipe for quick weeknight dinners. It can also be made in advance as it keeps well and the flavours even improve the next day. This soup is low in fat, vegan, gluten-free, oil-free, sugar-free and high in fibre, protein and iron. Add the onion, carrot, celery, garlic and bell pepper to a soup pot with a bit of the vegetable broth and cook for 5-10 minutes until starting to soften, stirring occasionally. You can saute in a bit of olive oil if you prefer. Stir in the spices and cook for a few more minutes. Add the broth, tomato sauce and black beans and bring to a simmer. Simmer lightly until the carrots are tender, about 15 minutes. Scoop half of the soup into a blender and puree until very smooth. Alternatively, you can use an immersion blender in the pot but I like the creaminess achieved by transferring it to the blender. Pour the blended soup back into the pot and stir in the cilantro. Season with salt and pepper and add a squeeze of fresh lime juice, if desired. Sub 2-3 chili peppers in adobo sauce for the jalapeno for more of a chipotle flavour. Start with 3 cups of vegetable broth and add a bit more if it seems too thick, it just depends on the exact amount of veggies you use and how thick you want your soup. Just my kind of meal! Full flavor and nutrition. On my to make list… The photographs wonderfully styled and nutritional information is spot! Just made this recipe for dinner! It was so quick and easy to make, and now I have dinner ready for the next few days. The flavour is amazing! And blending half of the soup gives it the perfect texture. Thanks for the great recipe! You’re so welcome!! So happy you liked it. Enjoy! I really liked this soup but I found that it needed more spices for my taste. I ended up adding more cumin and oregano and also adding some paprika and homemade “broth paste” to spice it up a bit. Maybe my tomato sauce was too bland! If I made it again I would also use even less water. I started with 3 cups like the recipe says and I thought that was even a little too much. Granted, I like my soups a bit thick, more like a stew. In general, though, this is a great, easy recipe! Thanks! So fast, easy and yum! I used red pepper instead of green and for spice used 2 1/2 T of Penzey’s Chili 9000 instead of separate spices. Delicious! Will have to find a way to bulk up the calorie count as a meal soup but it was a hit in our house! Awwwesome. So happy it passed the test! Let me know if you add anything next time! 🙂 Thanks for your comment. It’s a good one! Let me know if you try it! this was so good! I added kidney beans as well! Recipes look delish! Can you share where you got your pottery bowls?? LOVE!!!! They’re actually just from HomeSense! That’s awesome, so glad you enjoyed it! Thanks for letting me know! My husband jokes that I cannot follow a recipe to save my life – I have to put my own personal stamp on whatever dish I’m making…but I didn’t change your recipe much at all! Doubled the cumin, used a 28 oz can of El Patio Tomato Sauce (Mexican Hot Style), two 15 oz cans of organic black beans, 1 can of corn, 3 cups veggie broth, 1 cup water, a TBLSP or 2 of tomato paste, and a couple handfuls of finely shredded kale along with the cilantro…served with a spoonful or so of brown rice – delicious, thank you! The perfect warm and comforting soup! Love that this isn’t as heavy as a chili but still nice and creamy! I didn’t have celery so I roasted some diced sweet potato with S/P and added to the soup too. Thank you so much! Awesome, Abby! I’m so glad you liked it. This recipe doesn’t have to be exact to taste good! Happy it worked out. This is an excellent recipe! It goes really well with simply tortilla chips and salsa on the side for a mix of great flavor and a salty side. My husband and I LOVED this! Keep em’ coming! We’ve signed up! That’s awesome. So glad you liked the soup!! Thanks for joining my newsletter and for the comment! So tasty! Rich in flavor and hearty. Fresh avocado goes nicely on top. Wow! This is a winner! So delicious, this will be a weekly meal! Goes so well with slices of avocado. I was wondering; did you add any (dairy-free) cream to this? Mine was a good bit darker in colour than the photos. My partner and I enjoyed this soup, though with no jalapeños and only 1/4 teaspoon of chilli powder it was hot enough for us. It has a lovely flavour and was perfect to use the black beans I had bought but didn’t know what to do with. I didn’t have any red peppers/capsicum so added some cannellini beans, peas and spinach. Also left it chunky. I will definitely make this again. Thanks for sharing the recipe. Wonderful, so glad you enjoyed it! Hi Deryn, I made this again tonight and added the jalapeño and pepper/capsicum. I also blended half of the soup this time and it’s definitely better! I again added the cannellini beans and peas with 5 cups of stock. It still had lots of flavour for us. I really love this soup and how flexible it is. You really can add any veggies and it tastes great! Thanks again! I’m so glad you enjoyed it! Thanks for sharing your substitutions! 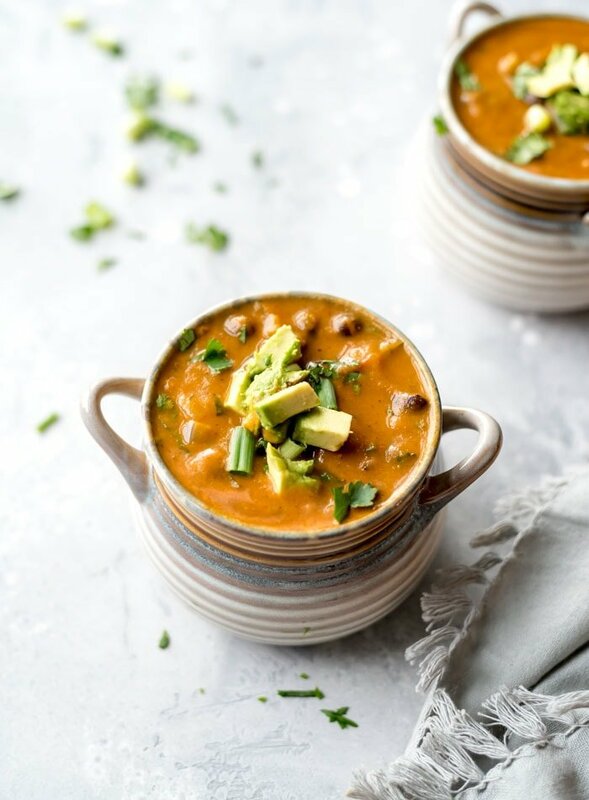 Probably one of my favorite black bean soup recipes I’ve tried. I like that this one was heavier on the vegetables than the beans, so it was a good consistency for me! Other bean soups I’ve tried have been way too thick. Thank you for sharing! So happy to hear that, Ali! Glad you liked it. It’s one of my faves too. So glad to hear that you family enjoyed it! Thanks! Only thing i added was turmeric for the extra antioxidants. This recipe was super easy and fun to make! Definitely going to become a regular recipe! Thanks so much! You’re so welcome! I’m so happy to hear you enjoyed it. Turmeric is a great addition! Just made this and I am loving it!!! I used adobo peppers since I had some in the freezer. I think avocado on top really seals the deal – it makes it so creamy. Will absolutely make again! So glad to hear it! I love this recipe too!! So good with the avocado, isn’t it? Unfortunately tomato makes up the base of this recipe and I can’t think of a replacement. You could try it without but I’m not sure how it would turn out.